The 2016 Jeep Wrangler has arrived, bringing the iconic on-and-off-road legend into the modern day with a host of improvements and features that have garnered praise across the industry. From design to performance, the Wrangler still boasts all the qualities that make it such a uniquely desirable vehicle. As Kelley Blue Book aptly puts it, “If you’ve decided you want a Jeep Wrangler, you probably don’t want anything else.” But even if you’re on the fence, the 2016 model has plenty to entice you. Take a look for yourself! As the original off-road 4×4, the 2016 Jeep Wrangler continues to be one of the best; when it comes to adventuring off the beaten path, few vehicles can match this model’s capability. According to Autoblog, the 2016 Wrangler “is an amazing machine when it comes to scrambling over boulders,” thanks to its heavy-duty suspension and, in the Rubicon model, Tru-Lok front and rear locking differentials to keep you steady. Along with clever design to improve ground clearance and the protective power of 3-mm-thick stamped steel skid plates, it all adds up to a real rough and tumble ride perfect for your next expedition. 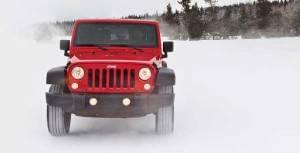 With a range of well-made engines, the 2016 Jeep Wrangler handily outperforms the competition. Its 3.6L Pentastar VVT V6 has gone through rigorous five-cycle testing to produce one of the most fuel-efficient engines on the market, with ratings of 14.2 L/100 KM in the city and 11 L/100 KM on the highway. And it’s powerful too, boasting 285 hp, 260 lb-ft. of torque, and “surprisingly good acceleration at relatively low rpm,” according to Autoblog. It’s such a stunning engine that Kelley Blue Book called it “the best thing to happen to the Jeep Wrangler since aftermarket winches,” and after a few moments behind the wheel, we’re sure you’ll agree. The 2016 Jeep Wrangler takes the rugged and wild icon to whole new heights, and now you can try one out for yourself at Crestview Chrysler, located at 601 Albert Street in Regina, SK. And if you want to learn more about our inventory, contact us online or over the phone at .